Walking along Rua do Almirante Sergio after our scrumptious lunch at A Lorcha last August, I chanced upon Restaurante Litoral – the other Macanese restaurant I wanted to try. I took note of it for when we return. I never thought that I would be trying this other famous Macanese restaurant so soon. The family decided to spend the holidays in Hong Kong and Macau. For a family of foodies, what better way to spend the holidays than in gastronome paradise? Restaurante Litoral, when I suggested it, was a unanimous yes. To others, Macau is more of a gambling mecca, to me it is a food haven. You will find Western and Chinese cuisines in hotels and clubs as well as in small sidewalk stalls, but the main point of a Macau visit (at least to me) is to delight in Macanese cuisine. The 500 years of multicultural influence lead to a fusion of Portuguese, Chinese, African, and Indian flavors that is now uniquely Macanese. Many dishes evolved from the spice blends the Portuguese women used attempting to replicate European dishes. Housed in a 2-storey building in a quiet street, Restaurante Litoral is packed to the bream during our visit and I have a sneaking suspicion it is every night. We were shown to our table on the 2nd floor where (again), a Filipina served us. We started with a squid salad tossed in lemon and olive oil dressing. Then came the clams, just as scrumptious as the one in A Lorcha. The soup infused with the delicious flavors of clams simmered in white wine, olive oil and lemon is fantastic especially when dipped in bread. Then the dishes came one after the other. 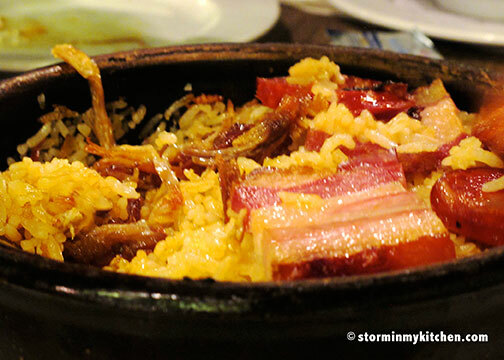 Baked Duck Rice – a cut above the rest. Rice simmered in duck stock and fat with succulent duck confit thrown in and then topped with bacon and chorizo. A dish with everything I love. 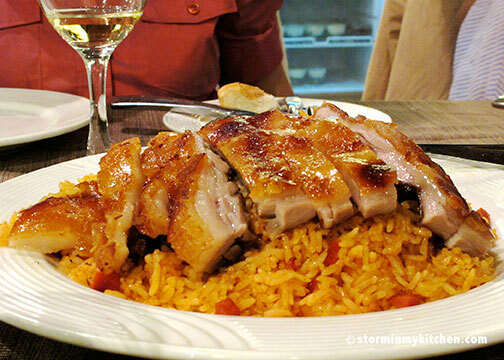 With the Baked Duck Rice, who would think we’d order another rice dish? But by the sound of it, Suckling Pig on Fried Rice, we just had to try it. It had us at suckling pig. Glad we did. It was lighter than the Duck Rice but the flavor and the crispy skin of the suckling pig was to die for. 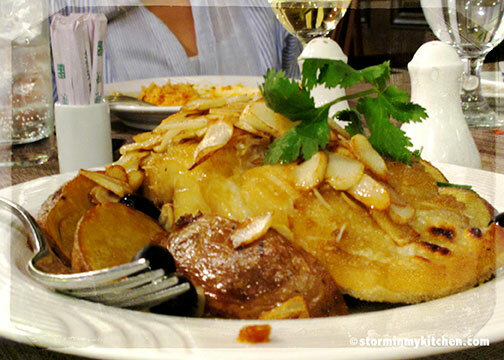 Bacalhau a Lagareiro or grilled cod-fish with potatoes and garlic. A common dish in Portugal, Spain and in some Portuguese colonies like Angola, Macau and Brazil. Its essential ingredient is salted codfish so be ready for the saltiness. I, for one, love Bacalhau, some are however put off by the saltiness. Salted cod has been around since 500 years ago when there was no refrigeration. Just like our daings and our danggits, drying and salting are ancient methods of preserving the nutrients and can actually make the fish tastier. 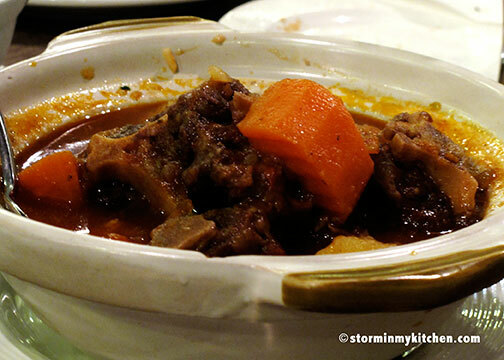 Braised Oxtail in Red Wine Sauce – extremely soft oxtail in very tasty sauce. Two thumbs up!! For dessert, we wanted to try the egg yolk soufflé but they ran out of stock so we settled with their chocolate mousse, mango pudding and of course their version of Serradurra, biscuit mousse. It was as yummy as the one we tried at A Lorcha. 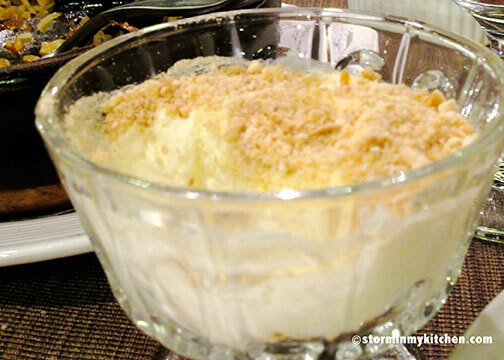 I will attempt to make this one of these days or I will be burning miles to get my fix of this very addictive dessert. My verdict: Maybe it’s the number of dishes we tried but in my humble opinion, Litoral wins over A Lorcha by a hair. Both restaurants are worth visiting again. Perhaps I’ll need to go back to A Lorcha to try more dishes next time. oh my goodness all look good. i’m salivating over the duck over rice dish. omg. 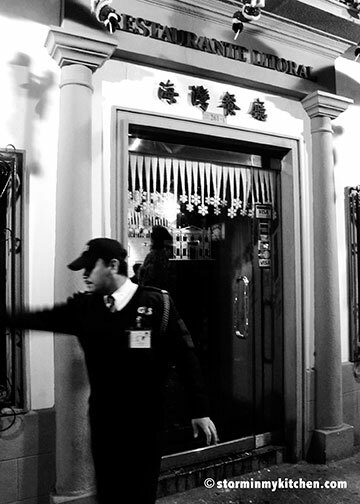 Is a Macanese food restaurant and should also be portuguese restaurant (but is very poor portuguese cooking). off center but near Barra. 3rd time here, first 2 times nothing special, although overpriced, understandable since is targeting tourists mainly. I’m sorry you didn’t have good experiences in Litoral. I am not Portuguese and have not gone to Portugal (yet) hence no first hand experience on real and authentic Portuguese cuisine. My experiences on of Portuguese cuisine would be from restaurants here in my home country and in Macau. I can only speak for how I find the food and as far as I’m concerned, I truly enjoyed their food. The Bacalhau, I did find quite salty. As for the service, I encountered nothing but graciousness from them. Thank you for your honesty though. 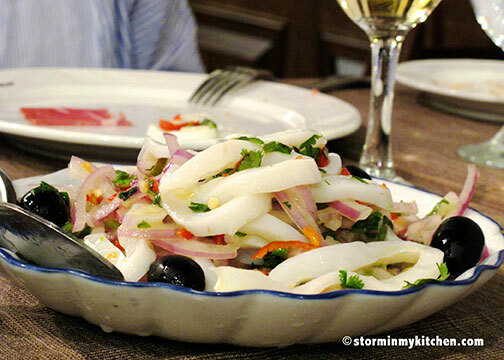 You are currently reading Where to Eat in Macau: Restaurante Litoral at Storm In My Kitchen.